Coastal journeys don’t get much more spectacular than the one along the Great Ocean Road from Melbourne to Kangaroo Island, just off the coast of Adelaide. Considered by many to be the Australian equivalent of California’s celebrated drive from Los Angeles to San Francisco along the Pacific Coast Highway, following the Great Ocean Road down the Victorian coastline, and then continuing onto South Australia’s sublime Kangaroo Island, is a stunning journey that encapsulates all that Australia has to offer: one glorious seascape after another, extraordinary wildlife encounters, and plentiful gourmet offerings. The cliff-hugging road was hewn from the rock by 3000 returned World War I soldiers using picks, crowbars and shovels. Penneshaw is a town located on the northeast coast of the Dudley Peninsula on Kangaroo Island. It took 14 years to complete and when it finally opened in 1932, the veterans dedicated the road as a memorial to their comrades who had died in the war. The road itself is only 124 miles or so long, but it’s best taken slowly, winding your way along the coastal curves, stopping at lookouts, browsing in the boutiques and galleries in the seaside towns, checking out the views from lighthouses and strolling along wide beaches famous for their surf. Leaving from Melbourne it takes 1.5 hours to reach Bells Beach, home to the world’s longest running professional surfing event, the Rip Curl Pro, and another 10 minutes down the road to Torquay, home of the Australian National Surfing Museum, dedicated to the art and culture of wave riding. Given its credentials, this is the perfect place to take a surfing lesson; Torquay Surf Academy’s private lessons take about two hours and cater to all levels of skill. Out of the water, make your way to Lorne for the night; the 45-minute trip can easily take an hour or two, stopping at towns like Anglesea and Aireys Inlet. Heading out of Lorne, it’s a one-hour drive to Apollo Bay, where the road leaves the coast and cuts through farmland and into the dense rainforest of Otway National Park. It’s here that you can get a bird’s eye look at the giant tree ferns and eucalypts on the Otway Fly, a boardwalk through the canopy 82 feet above the ground. Check out the beautiful Apostles as the sun begins to set. Arriving at the iconic 12 Apostles rock formations (there are actually only eight), the result of wind and wave erosion that has carved towers out of the surrounding cliffs, is truly breathtaking. Watch as the setting sun casts a honey glow over their surfaces and the startlingly blue sea froths and churns. Other rocky stars along this stretch include Loch Ard Gorge, the site of a tragic shipwreck in 1878, and London Bridge, which dramatically lost one of its arches in 1990 stranding two startled sightseers on the newly formed tower. Overnight in Port Fairy, a charming little town crammed full of historic sandstone buildings and cute rose-clad cottages. The day trippers don’t make it this far, so the streets are sure to be quiet, making it a pleasure to browse its pretty stores and relax in one of its many cafes. On the South Australian side of the border the road curves around Mt Gambier’s mysterious blue lake. The normally steel-gray waters inside an extinct volcano inexplicably turn cobalt blue from December to March. Arrive at Penola in the heart of the Coonawarra wine district in time for lunch overlooking the famous vines of the fabled terra rossa, a 7.5-mile strip of soil that produces some of the best red wines in the country. For those keen to learn more about what makes these wines so special, join a wine blending masterclass at Wynns Coonawarra Estate winery, before dining in an old church, Pipers of Penola. It’s one of the most highly awarded regional restaurants in South Australia and it lives up to its promise with a delicious crayfish bisque soufflé, cherry-wood smoked duck, and a fabulous Coonawarra wine list. The picture perfect seaside town of Robe is worth putting some time into. Take in its collection of historic sandstone buildings, eat fish and chips by the sea and then skirt along the 80-mile stretch of the Coorong, a narrow bird-filled lagoon that flanks the beach, while pelicans soar in the thermals above. Three hours away is Cape Jervis, where the ferry sets off on the 45-minute crossing to Kangaroo Island. Like the Great Ocean Road, Kangaroo Island, or ‘KI’ as it’s known by locals, deserves time and attention. Some of the incredible wildlife you can see at Hanson Bay Wildlife Sanctuary. You really need a couple of days to do it justice and visit all the landmarks, from its three lighthouses to its abundant – and impossibly cute – animal inhabitants. For a truly indulgent experience check into the multi-award winning Southern Ocean Lodge. The stunning clifftop lodge, with its mesmerizing views, innovative architecture and fine dining, is a wilderness experience at its most refined. A full day can easily be taken up with overdosing on KI’s scenery. There are 27 officially designated geological monuments on the island, two of the most awe-inspiring being Admirals Arch, a naturally formed rock bridge on the south-west of the island, and Remarkable Rocks, a cluster of huge weather-sculpted boulders perched on a granite dome that swoops dramatically toward the sea. The coastal winds can be bracing, but respite can be found at any of the numerous wineries and restaurants scattered across the island. In recent years Kangaroo Island has positioned itself as a gourmet escape, enticing visitors with the quality of its fare, from award-winning restaurants like Sunset Food and Wine to hand-crafted spirits; book a bespoke gin blending masterclass at Kangaroo Island Spirits. The wildlife steals the show on KI. Close to half of it is national parkland, which is home to some of the most diverse wildlife you’ll find concentrated in one area anywhere in the country. There are thousands of kangaroos, so many koalas they are an everyday occurrence, and one of the largest colonies of the endangered Australian sea lion; a ranger guided walk along the beach at Seal Bay, where the sea lions haul out to rest, is a highlight of any visit. As is the Platypus Water Hole Walk, an easy two-hour walk through the Flinders Chase National Park. Finish the day with honey ice-cream – the island is home to the world’s only pure strain of Ligurian bees. Taking in the stunning Fleurieu Peninsula on the way to Adelaide is a fitting end to this ultimate Australian coastal journey. A beautiful natural archway in Penneshaw, Kangaroo Island. 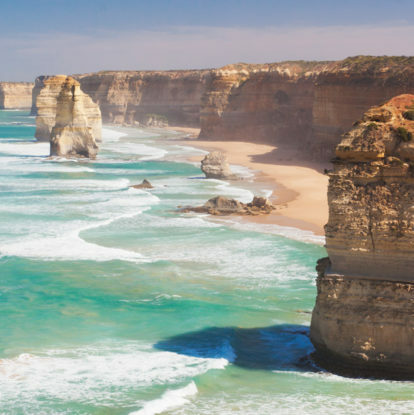 There are various ways to experience the Great Ocean Road, from day tours that cover off all the highlights to longer journeys that allow you to take your time, all departing from and returning to Melbourne. The Great Ocean Road website has ample suggestions on what to see and do along the way. Or you can visit the stunning Grampians National Park as well by taking a tour along the Great Southern Touring Route; the road heads inland outside of Port Fairy. To travel the Great Ocean Road to Kangaroo Island, opt for Trafalgar’s seven-day Great Ocean Road and Kangaroo Island tour. Qantas has regular connecting flights to Kangaroo Island from most capital cities, with direct flights from Adelaide taking just 30 minutes. It’s around a 90-minute drive to the ferry terminal at Cape Jervis from Adelaide, but tours are available that also take in the McLaren Vale wine region along the way. Exceptional Kangaroo Island offers a range of tour packages on the island; its In Style package includes return transfers from Adelaide and two full days of personalized touring. Not matter which direction you take, you will need to pass through Melbourne and Adelaide. Check out our guides to Australia’s culture capital (Melbourne) and Australia’s wine capital (Adelaide). The Ultimate Kangaroo Island experience: 6-day Adelaide and Kangaroo Island luxury from USD$2,936pp*. Outback to Islands: Explore the Australian outback to Kangaroo Island on The Ghan Expedition from USD$3,540pp*.